My time at the Marr Sound Archives has been an amazing learning experience. The people who work at the archives are all awesome people and Kelley Martin especially has been a kind, supportive, and all around great supervisor. Splitting my time up between archiving and public history was a good decision because it allowed me to get a sense of both sides of the profession. It was nice to be able to create an online feature of the John B. Gage collection I processed. 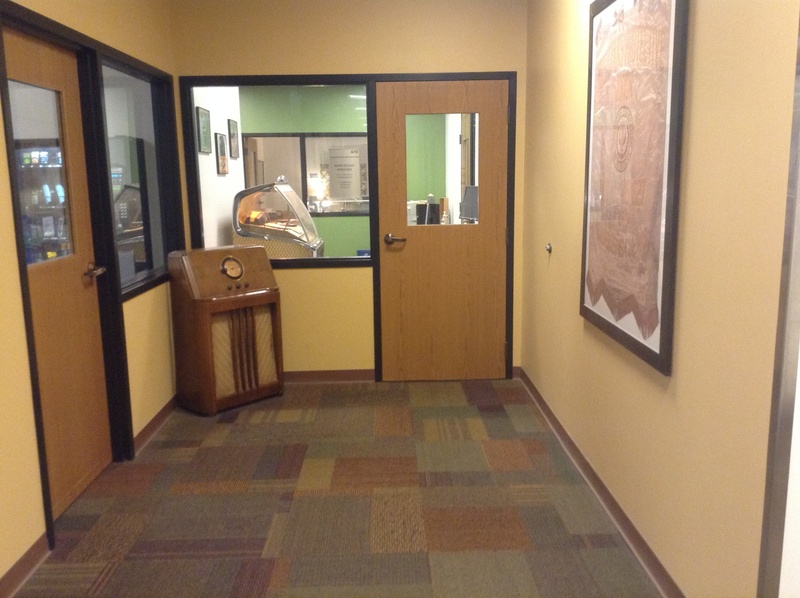 If any future UMKC historians read this post, they should seriously consider interning at the Marr Sound Archives, especially if they have a research interest that can be incorporated into the Marr collection. As I have expressed in my previous posts, there is so much to be explored at the archives. 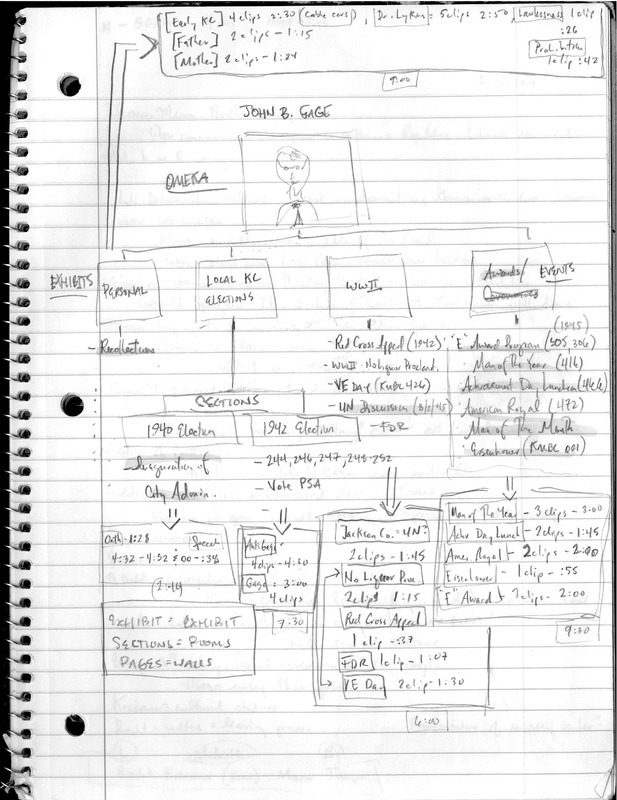 The amount of 498 Capstone papers that could come out of the material housed at the Marr Archives would fill volumes. Well, I hope my digital friends and real friends and stranger friends get something out of the John B. Gage Audio Collection Omeka site, and if not, that is okay too. 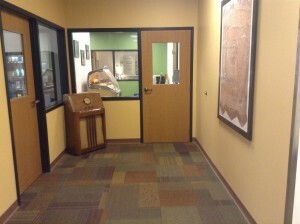 This entry was posted in HistoryMaking and tagged Internship, Marr Sound Archive, public history on May 21, 2015 by Kelly Hanguer. The Audio Preservation Meditation Continues . 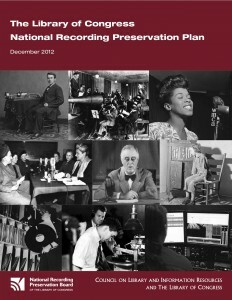 . .
Back again with The Library of Congress National Recording Preservation Plan discussed in the last post. When I read through this information the first time, I marked ideas or “recommendations” made by the authors that caught my attention. I was struck by the fact that the Library of Congress has nearly “3.5 million recordings that embody more than 120 years of audio history.” What the authors suggest though, is that the digitized audio is not reaching enough researchers. In order to make these recordings more accessible, a centralized network is needed. As an independent musician, I thought it was especially interesting how the Library of Congress recognized the realities of independent musicians today. The writers illustrate the fact that artists are tending to not copyright their music, and are oftentimes not manufacturing hard copies of the music. More and more, music is disseminated online through the channels of BandCamp, Soundcloud, and Spotify. The Library of Congress personnel who authored the National Recording Preservation Plan suggest that the Library of Congress should form working relationships with record labels and other music industries to ensure that engineers are recording music in such a way that it can be preserved. Considering the amount of music out there, a multilateral approach is needed. Now, you may ask, how does one preserve audio? Well the answer is complex but essentially it entails creating a digital file from a record, reel-to-reel, tape, CD, or any other format of sound. The digitization process involves a set of best practices and standardizations one should adhere to in order that the digital file be as sturdy as possible. Once the archival digital file is created, upkeep from archivists is necessary to ensure its longevity. If you are interested in learning more about this, go ahead and download The Library of Congress National Recording Preservation Plan. This entry was posted in HistoryMaking and tagged copyright, Digitization, Independent Music, Library of Congress National Recording Preservation Plan, Marr Sound Archive on May 19, 2015 by Kelly Hanguer. Summary: An exciting opportunity to get in on the ground floor of a history program for a more-than-century-old pediatric medical center. The research associate will work in concert with the Director of Archives for Children’s Mercy to uncover stories, themes, facts, photos and more to tell the story of this leading children’s hospital that was started by two sisters – both doctors – in 1897s. Background and history of the individuals participating in the oral history project. What was Kansas City like in 1897? How were women perceived, and particularly these two women? What about “orphan trains?” What was the state of medicine at the time? Pediatrics? In the 1950s, Children’s Mercy had outgrown its hospital on Independence Avenue in Northeast Kansas City. What was the discussion and h0w was the decision to made to relocate on Hospital Hill near General Hospital (in Missouri) and not near the University of Kansas Medical Center (in Kansas)? Children’s Mercy also lost its accreditation for medical education at this time. How was it restored? The role of women in society, in business and in caring for children. Progress in medicine and medical research and how that affected Children’s Mercy. Research materials: The Children’s Mercy Archives consists of a large collection of printed material, photos and 3D artifacts. The collection is in the process of being turned over to the University of Missouri – Kansas City Special Collections Library. It will begin this summer to organize, catalog and digitize (as appropriate.) 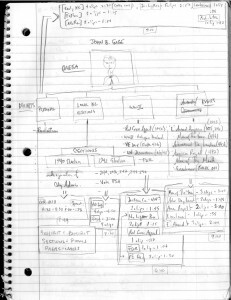 Finding aids will be developed and put on –line. The Library staff will work with Children’s Mercy to digitize and make available any and all materials we wish to share with the public and/or researchers. Children’s Mercy is maintaining ownership and will have free access to the collection. The collection consists of thousands of photographs, board and foundation minutes dating to the 1930s (at least), patient and financial information dating to the earliest part of the 20th Century, scrapbooks, press clippings, videos (in VHS and DVD formats) and more. The artifacts, currently housed in a warehouse in Central Kansas City, MO, have not been assessed or cataloged for quite some time. There are currently no detailed long-term plans for those artifacts. In addition, there are two published histories of the hospital and one unpublished manuscript. The published books include: A history of Children’s Mercy Hospital by Roger Swanson (1961); and Women of Vision by Beatrice Johns (2004). The second books covers the history only until the 1930s. About half the books consists of accounts of Johns own stays at Children’s Mercy in the 1920s. The manuscript is , The History of Children’s Mercy Hospital in Kansas City, Mo., by Herbert A Wenner and Sydney F. Pakula (1984). The authors are both former Children’s Mercy doctors and the book contains a plethora of information about the medical staff from the 1960s until 1984. There are countless other sources of information, including the Kansas City Star, the Jackson County Medical Society newsletters, the Children’s Mercy Communications and Marketing Department (which includes the Archives), and many interested people with personal histories of Children’s Mercy. For more information and to apply, contact Archivist Thomas McCormally tmccormally@cmh.edu. This entry was posted in Open Internships on May 1, 2015 by Chris Cantwell.